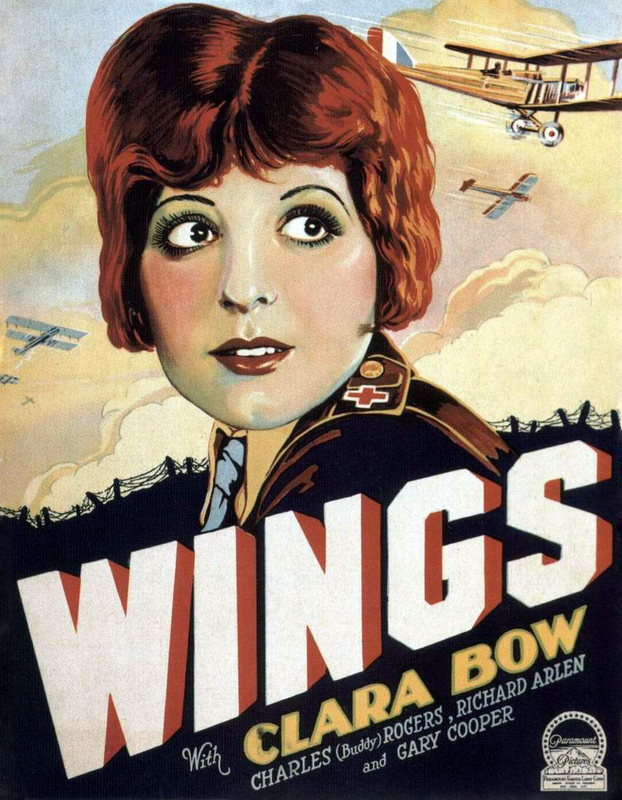 The silent film 'Wings' is all about airplanes. So it's fitting that I'm posting this preview of the film (which I'm accompanying this week in Concord, N.H.) from an eastbound JetBlue Airbus 321 somewhere high above Nebraska. Actually, the altitude is now exactly 34,793 feet, according the readout on the seatback video screen in front of me. 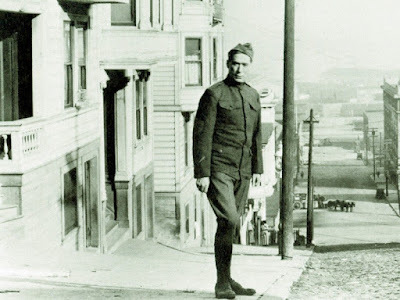 I'm heading home after accompanying a William S. Hart drama, 'The Cradle of Courage' (1920), last night at the Niles Essanay Silent Film Museum in Fremont, Calif.
Before I get to 'Wings,' a few thoughts about the Hart drama, which was unusual. Unlike so many of his features, it's not a Western. Instead, it's about doughboys returning home to city life (in this case, San Francisco) after World War I. And with the 100th anniversary of Armistice Day coming up next weekend, I was glad for the chance to see this rarely screened Hart opus, in which our hero gives up his pre-war occupation as a crook to become a policeman instead. And the 16mm print at the Niles Museum was a stunner: sharp, with great tonal values throughout. 'The Cradle of Courage' offers a strong dose of life as it was lived in the nation's cities a century ago. The settings are real and grim, including many exterior shots filmed on location in the city by the Bay. Dialogue in the intertitles is filled with antique argot and colorful tough-guy slang. But it's especially powerful as a reminder that those who served in what we now call World War I often faced fresh battles upon returning home. And that's worth remembering as we approach the centennial of the day the guns went silent. You can see that same dynamic in other World War I movies of the silent era. It's in 'Wings' (1927), which I'm accompanying this Wednesday, and also 'The Big Parade' (1925), which I'm doing music for on Sunday, Nov. 11 at the Somerville Theatre. Both have powerful and bittersweet "returning home" scenes. My own homecoming later today will involve mostly getting licked by two dogs. So as centennial of Armistice Day approaches, it's worth remembering how so many did not have it so easy. And one way to remember those who served, and to honor their sacrifices, is to take in a movie such as 'Wings.' I think a mainstream film aimed at a general audience captures some of the excitement and also the dread of the war in a manner quite different from any history book or documentary. Well, this week, you can see for yourself. More info about our screening of 'Wings' at Red River Theatres in Concord, N.H. is in the press release below. Hope to see you there! CONCORD, N.H.—It won 'Best Picture' at the very first Academy Awards, with spectacular airborne sequences and a dramatic story that still mesmerizes audiences today. 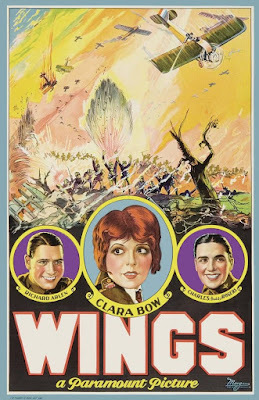 'Wings' (1927), a drama about U.S. aviators in the skies over Europe during World War I, will be shown on Wednesday, Nov. 7 at Red River Theatres, 11 South Main St., Concord, N.H. The screening is in honor of the 100th anniversary of the Armistice of Nov. 11, 1918, which ended the "Great War" and which led to our modern observance of Veterans Day. The show will allow audiences to experience 'Wings' the way its makers originally intended: on the big screen, with live music, and with an audience. ‘Wings’ (1927) starring Clara Bow, Buddy Rogers and Richard Arlen will be shown with live music on Wednesday, Nov. 7 at 7 p.m. at Red River Theatres, 11 South Main St., Concord, N.H.
Tickets $12 adults, general admission. For more info, visit www.redrivertheatres.org. or call (603) 224-4600.